Bacharach MGS-450 Gas Detector Transmitter with infrared sensor for Carbon Dioxide (CO2) 0-5000ppm to 0-50000ppm measurement in Refrigeration Applications. 3 x relays (low, high & fault), analog output (4 to 20 mA, 0 to 5 V, 0 to 10 V, 1 to 5 V, 2 to 10 V), RS485 MODBUS RTU output, audible & visual alarms. IP41 or IP66 Housing. CE, UL and CSA Approvals. Factory configured for either R600 or R290. 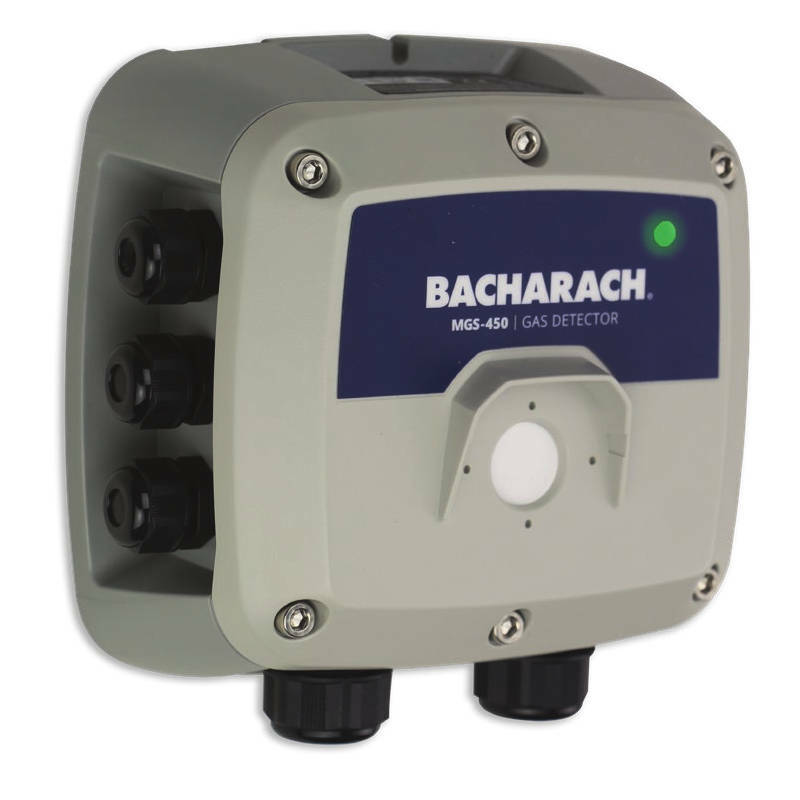 Bacharach�s MGS-450 Gas Detector makes compliance with refrigeration safety codes simple and easy, saving time and money on equipment and installation. Using the MGS-400 App, users can intuitively use, commission and maintain their gas detection system without the need for specialty training or tools. Pre-calibrated sensor modules simplify maintenance, take minutes to exchange and do not require the use of calibration gas. The MGS-450 can trigger additional audio-visual alarms and act as a standalone gas detection system, or integrate easily into a BMS / BAS or with Bacharach�s optional MGS-408 Gas Detection Controller. 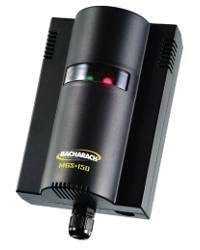 3015-8041 Bacharach 860 Series Electronic Xenon Horn (100dB) and Strobe (60fpm) for MGS-400 Detectors. Low Current and High Decibel. Thermoplastic housing. ..
6302-0090 Bacharach MGS-410 Gas Detector Transmitter with infrared sensor for Carbon Dioxide (CO2) 0-5000ppm to 0-50000ppm measurement in Refrigeration Applications. RS485 MODBUS RTU output, audible & visual alarms. IP66 Housing. CE, UL and CSA Approvals. ..
6302-4090 Bacharach MGS-460 Gas Detector Transmitter with remote (5m) infrared sensor for Carbon Dioxide (CO2) 0-5000ppm to 0-50000ppm measurement in Refrigeration Applications. 3 x relays (low, high & fault), analog output (4 to 20 mA, 0 to 5 V, 0 to 10 V, 1 to 5 ..
6702-8000 Bacharach MGS-408 Gas Detection Controller for up to 8 MGS-400 Series detectors over Modbus RTU in Refrigeration Applications. Includes 3 x relays (low, high & fault), RS485 Modbus RTU communications, audible and visual alarms, event logging, powers MGS-4 ..
> GAS DETECTORS (GENERAL-PURPOSE) > CARBON DIOXIDE : 43 Items found. Intec Controls I-M308 Infrared (NDIR) Gas Transmitter for Carbon Dioxide (CO2) 0-2000 or 0-5000 ppm. Voltage (0-(5)10 V) or current (4-20 mA) output signal. Wall or Duct mounted. Tri-color LED (normal/warning/alarm) and 24 VAC/VDC powered. Intec Controls I-M350 Infrared (NDIR) Gas Transmitter and Control System for Carbon Dioxide (CO2) 0-2000 or 0-5000 ppm. Voltage (0-10 V) or current (4-20 mA) output signal. Wall or Duct mounted. Tri-color LED (normal/warning/alarm). Optional relay/ouput control, audible alarm, LCD Display and relative humidity measurement. 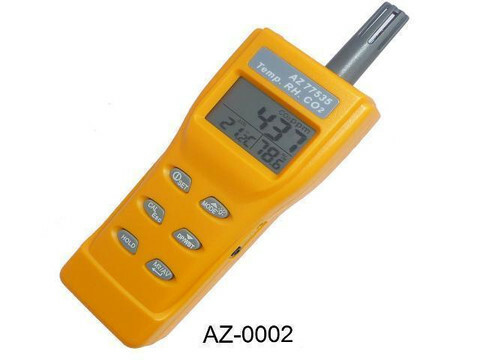 CO2Meter pSense Portable Detector for Carbon Dioxide (C02) 0-2000 ppm with power supply. Temperature and Humidity Meter. 80dB audible alarm. 120-220 VAC Adapter. Includes 4 AA Bateries, ABS Plastic Case and Manual. 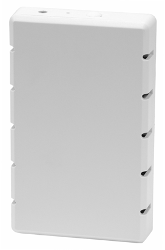 CO2Meter eSense FAI Wall-Mounted Carbon Dioxide (CO2) Alarm for LEED with Power Supply. Includes audible alarm and flashing light. 4-20mA Ouptut. CO2Meter eSense FAI (Fresh Air Indicator) Wall-Mounted Carbon Dioxide (CO2) Alarm for OSHA 5000 ppm with Power Supply. Includes analog (0-6000 ppm) and digital (4-20mA) outputs. Audible Alarm. CO2Meter pSense Portable Detector for Carbon Dioxide (C02) 0-2000 ppm with Data Logger Kit and Power Supply. Temperature and Humidity Meter. 80dB audible alarm. 120-220 VAC Adapter. Includes 4 AA Bateries, ABS Plastic Case and Manual. 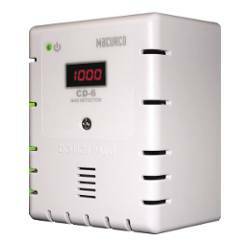 MACURCO CD-6 low voltage Carbon Dioxide (CO2) 0-5000ppm Gas Detector, controller and transducer. 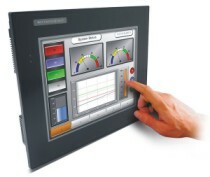 Selectable 4-20mA output, buzzer, alarm and fan relays and digital display options. 12 to 24 VAC or 12 to 32 VDC power. ETL Listed to UL 61010-1. 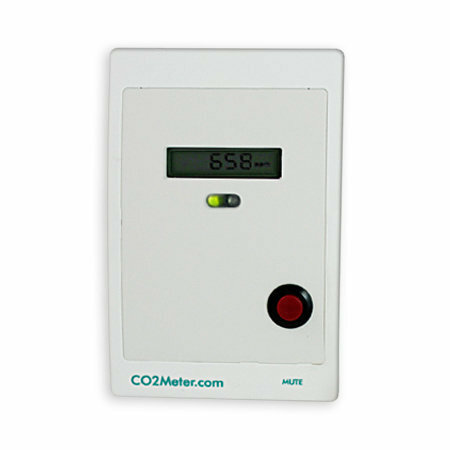 CO2Meter eSense Programmable Wall-Mounted Carbon Dioxide (CO2) Alarm with Power Supply. Customizable 0-10V (0-3000 ppm) analog output. MACURCO CD-12 line voltage Gas Detector, controller and transducer for Carbon Dioxide (CO2) 0-5000ppm. Selectable 4-20mA output, buzzer, alarm and fan relays with digital display. 100 to 240 VAC 50-60Hz power. ETL Listed to UL 61010-1. 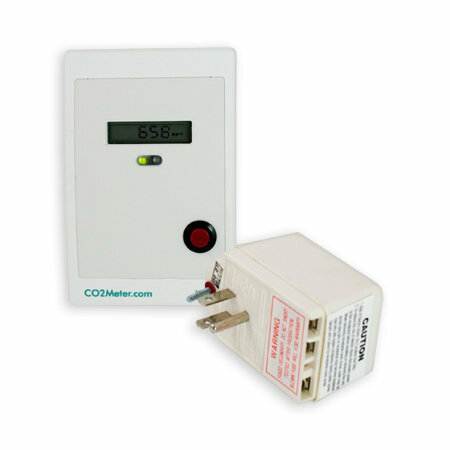 CO2Meter eSense Programmable Wall-Mounted Carbon Dioxide (CO2) Alarm with Power Supply and Program Cable. Customizable 0-10V (0-3000 ppm) analog output. 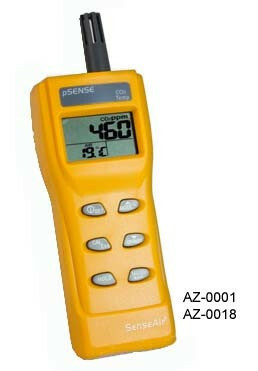 CO2Meter pSense High Accuracy (�30 ppm) Portable Detector for Carbon Dioxide (C02) 0-5000 ppm with power supply. Temperature and Humidity Meter. 80dB audible alarm. 120-220 VAC Adapter. Includes 4 AA Bateries, ABS Plastic Case and Manual. 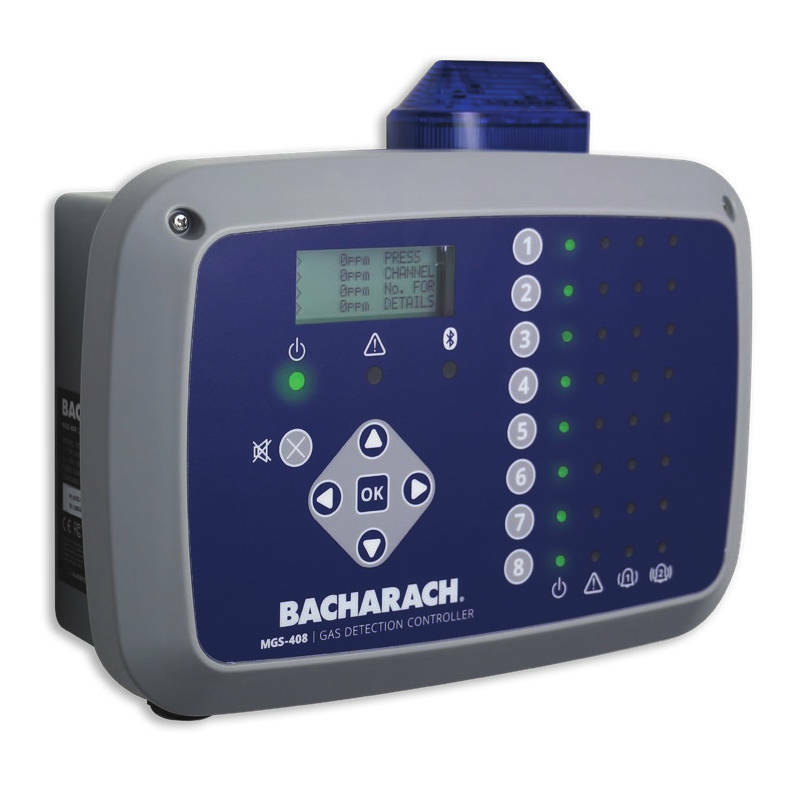 Bacharach MGS-410 Gas Detector Transmitter with infrared sensor for Carbon Dioxide (CO2) 0-5000ppm to 0-50000ppm measurement in Refrigeration Applications. RS485 MODBUS RTU output, audible & visual alarms. IP66 Housing. CE, UL and CSA Approvals. CO2Meter pSense High Accuracy (�30 ppm) Portable Detector for Carbon Dioxide (C02) 0-5000 ppm with Data Logger Kit and Power Supply. Temperature and Humidity Meter. 80dB audible alarm. 120-220 VAC Adapter. Includes 4 AA Bateries, ABS Plastic Case and Manual. 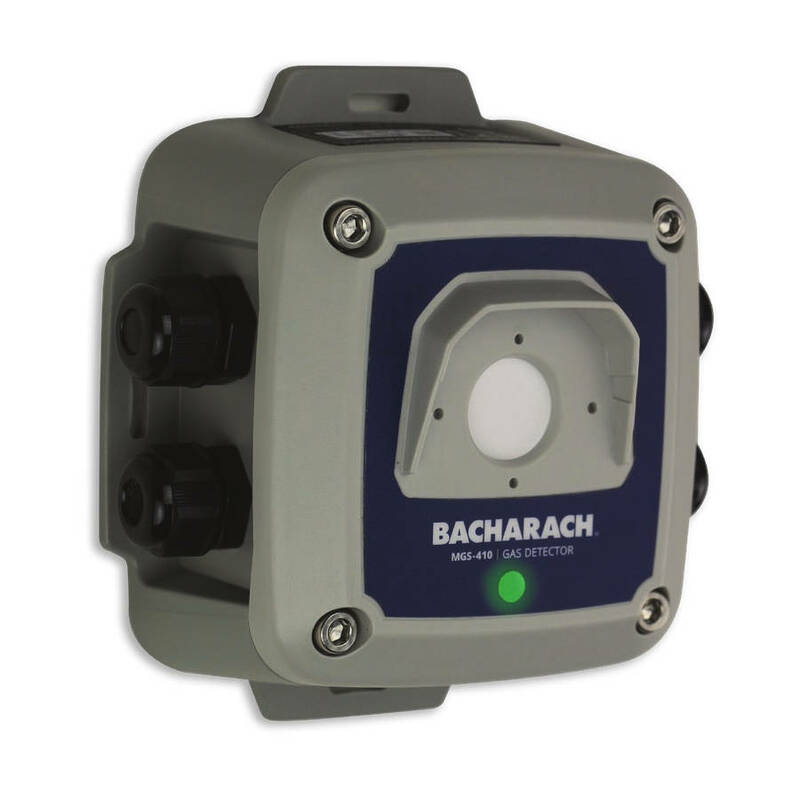 Bacharach MGS-150 Gas Detector Transmitter with infrared sensor for Carbon Dioxide (CO2) for Industrial and Commercial Refrigeration. 4-20mA, 0-5V, 0-10V, 1-5V or 2-10V user selectable analog outputs. Onboard Alarm LED, audible buzzer and alarm relay. IP41 Housing (IP66 optional) and Remote sensor option. CE, IEC61010, Exd and UL CSA Approvals. 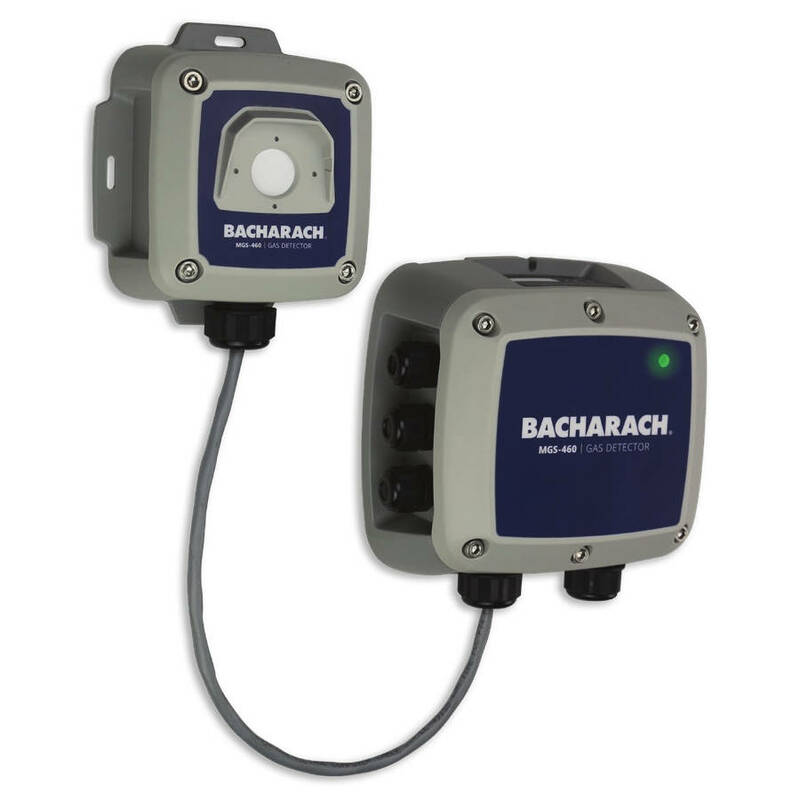 Bacharach MGS-460 Gas Detector Transmitter with remote (5m) infrared sensor for Carbon Dioxide (CO2) 0-5000ppm to 0-50000ppm measurement in Refrigeration Applications. 3 x relays (low, high & fault), analog output (4 to 20 mA, 0 to 5 V, 0 to 10 V, 1 to 5 V, 2 to 10 V), RS485 MODBUS RTU output, audible & visual alarms. IP66 Housing. CE, UL and CSA Approvals. 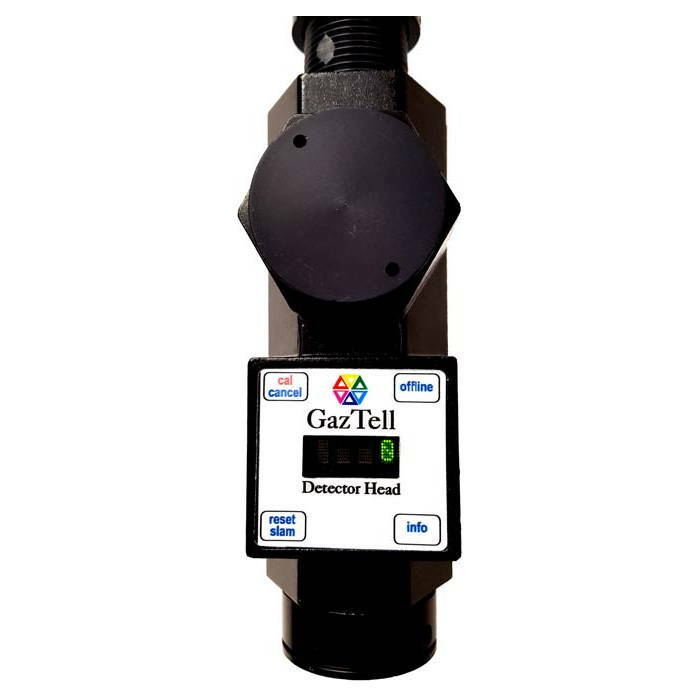 Delphian GazTell Fixed Point Infrared Gas Detector for Carbon Dioxide (CO2) 0.02% to 4.5% vol. 4-20mA Output. Optional Modbus RTU Output and Alarm Relays. SIL2 Approval. 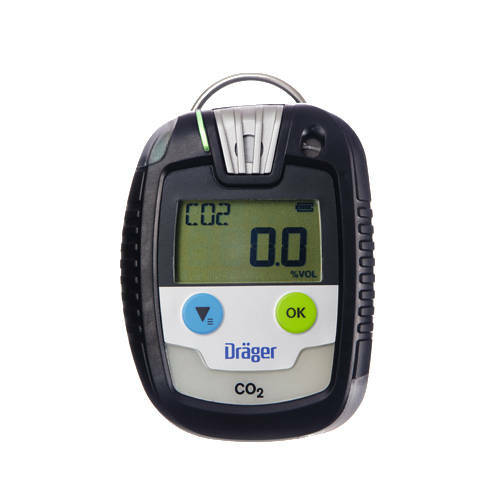 Suitable for Class I Div 1 & 2 Groups C, D.
Draeger Pac 8000 Personal Single-Gas Detector for Carbon Dioxide (CO2) 0-5 Vol%. Includes 360� alarm signal, large display, data and event logger, battery and a replaceable filter membrane for water and dust protection. IP68. CSA, IECEx, ATEX and CE approvals. 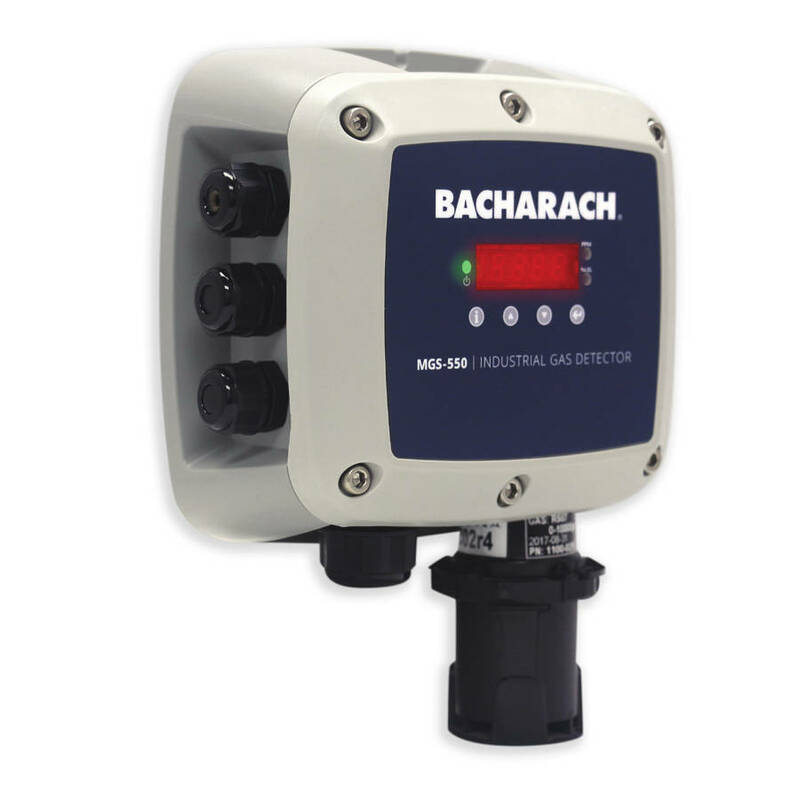 Bacharach MGS-550 Industrial Refrigerant Gas Detector with infrared sensor for Carbon Dioxide (CO2) 0-5000ppm to 0-50000ppm. 3 x relays, analog output, RS485 MODBUS output and 5-digit display. Remote sensor capabilities. IP66 Housing. CE, UL and CSA Approvals. 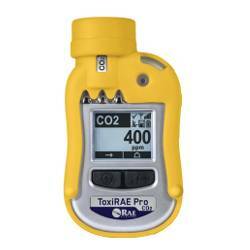 ToxiRAE Pro PGM-1850 Personal Portable Monitor For Carbon Dioxide (CO2) 0-50000 ppm with replaceable sensor, filter and Li-ion battety. Automatic bumb testing and calibration with AutoRAE 2 (optional). Includes Datalogging, Graphical LCD display, 2 buttons for operation and programming. Not for hazardous areas. IP-65. Wireless-capable option. CTI GasGuard CO2 Carbon Dioxide Infrared Sensor (0-1%, 0-3% and 0-5%) for gas leak detection in wineries, food processing areas, bottling plants and others. No false alarms. 4-20 mA output, 24VDC power supply and NEMA 4X polycarbonate enclosure.